Huge congratulations to Faye and Mike who were married in a beautiful church wedding then celebrated with their family and friends at the Groom’s family home in Broomfield, Chelmsford. 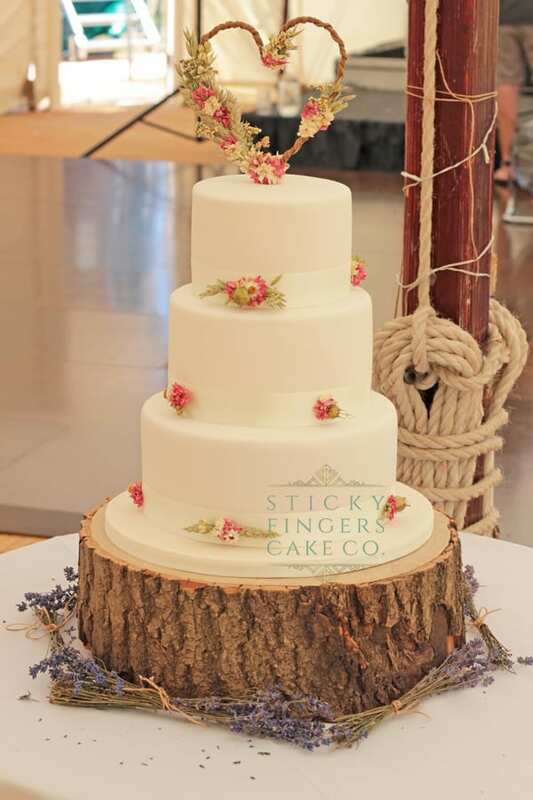 A simple 3 tier iced wedding cake decorated with ribbon and dried flowers and topped with a cute dried flower and birch heart shape cake topper, supplied by the happy couple. This wedding cake generated so much interest on Social Media, so just goes to show simple is sometimes the way to go! Yummy flavours of Traditional Fruitcake, and two tiers of Lemon and Elderflower plus an extra two cutting cakes of Strawberry and Champagne.